GENERALLY REGARDED as one of the best heavyweights of his era, McVey never got to fight for the world title. He was born in Oxnard, California on May 17, 1885. He stood a shade over 5-10, and weighed 200lbs. In his prime, McVey was a hard puncher and possessed fine defensive skills. He turned pro in 1902, and a year later was matched against future heavyweight champ Jack Johnson. Although Johnson won the fight, it went the 20-round limit. Since few mix-race bouts were made during the era that McVey fought in, most of his opponents were black. He fought fellow Hall of Famers Joe Jeanette and Harry Wills five times apiece and battled Sam Langford 15 times. McVey's most memorable bout took place April 17, 1909 against Jeannette in Paris. He knocked down Jeannette 27 times and was sent to the deck 11 times himself before he was forced to quit in Round 50, because his eyes had been swollen to the point he could no longer see. Although McVey seldom fought white fighters and never fought for the title, his exceptional ability, more than his skin color, was the reason. Historians have overlooked the fact that McVey's prime took place during the reign of Jack Johnson (1908-1915). During his reign, Johnson put his title on the line 11 times, but only once, against Jim Johnson in 1914, was his challenger black. McVey did square off with Johnson in a six-round exhibition in Havana two days before Johnson lost the title to Jess Willard. 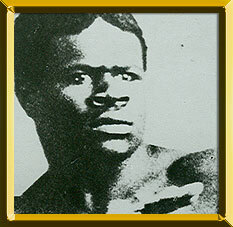 Johnson, who was six years older than McVey, owned three hard-fought victories over the Californian (W 20, W 20, KO 20). However, all three bouts took place before McVey's 19th birthday. During his 82-bout career, which lasted from 1902-1920, McVey fought all over the world including, England, Australia, Cuba, Chile and Argentina and amassed a record of 63 wins, 12 losses, 7 draws, 13 no decisions, 2 no contests with 48 knockouts. He died on December 23, 1921 in New York City.